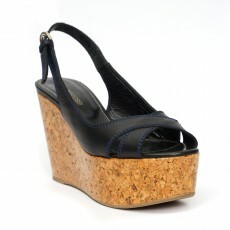 Chic yet casual, this comfortable and functional version of heels offer sturdy and ergonomic silhouettes. 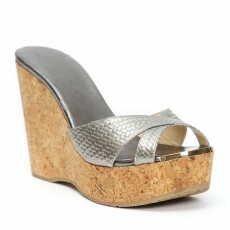 Introduced into luxury fashion by a shoe designer into the Italian leather industry in 1930, wedges have since been the perfect alternative for stilettos. Wedged sandals, as the name suggest are a type of heel that illustrate the shape of a wedge, a shape that provides utmost stability in terms of construction, these heels fit perfectly on all kinds of shoe-tops, boots, sandals, slide-ons, strappy gladiators, transforming the shoe into a sophisticated closet staple. While offering comfort, high-end wedges don’t give up on the edge factor. According to your preference these wedged heels go from the simple and trendy platform to high slopes for that cut throat style, in materials such as cork, felt, leather and fabric. 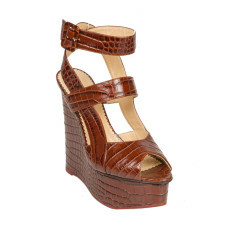 These shoes provide a blank canvas to create interesting detailing on the heel to make them stand out from the crowd. Gucci showcases its tattoo collection’s signature print on gorgeous soft leather, while Jimmy Choo plays with psychedelic patters to create the perfect statement shoe. 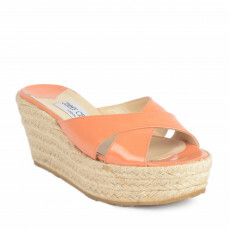 Dress it up or dress it down, buy your perfect wedges from our coveted collection. LabelCentric is your one stop destination, for pre-loved luxury accessories, based out of Mumbai, India. We bring to you an online shopping experience that is luxurious, safe and confidential.